Welcome to the 15th Annual Rockland County Minor League Tournament of Champions in memory of Michael MacRobbie. Michael passed away in the year 2000 at the age of 11. The Nanuet 2000 Little League season was dedicated to him, and that same year this Tournament was established. The Minor League division champions from each town in Rockland County come to Nanuet to represent their town in this great tournament. Due to severe medical issues, Michael never did get to play the great game of baseball. But despite his disabilities, he enjoyed coming down to the Nanuet Little League fields and watching his siblings and friends play, father coach, and mother volunteer. He was a student at the Jesse Kaplan School. Over the years, funds raised during the Minor League Tournament of Champions have been donated to the Jesse Kaplan School, as well as families in need in our community. 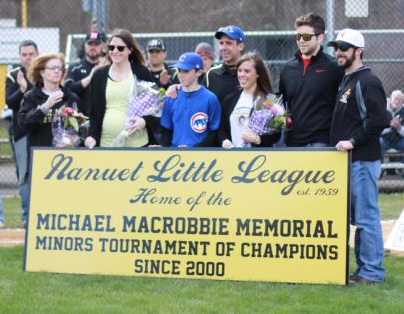 Through their continued hard work, dedication and tireless hours of volunteering, the Nanuet Little League continues to honor Michael's memory in helping others in our community. To commemorate the 15th anniversary of this charitable tournament, Nanuet Little League is displaying a new sign that is located on Wilhelm field.